At most traditional Thanksgiving gatherings tomorrow, the average person will enjoy a couple beers during the day while watching football and visiting with family, but when it comes time for the turkey a switch to wine is common. There is no need for you to ditch the beer as long as you find something proper for the occasion. Not that wine can’t pair just fine with turkey, but beer has a wider range of styles and flavors that allow it to pair well not just with the turkey itself, but with your mom’s special stuffing and the pumpkin pie from grandma. Sierra Nevada Celebration – This seasonal IPA might not pair particularly well with dinner, but it’s great to have around pre-dinner for hanging out watching football. It’s a bit darker than your average IPA and has a moderate caramel malt backbone to support ample citrus/pine hop flavors. It has become one of my favorite IPAs, but it is a winter seasonal and won’t be on shelves forever. Orval – This unique Belgian Trappist ale would be great to break out while appetizers are being passed around. It’s a refreshingly bitter, fruity and herbal beer that helps to cleanse the palate between different appetizers. One of my favorite beers of all time. Saison Dupont – Saison just may be the most versatile beer style and would be a great choice to match the dizzying array of sides your mom might be serving this year. A complex mixture of spices and herb flavors combine with a sharp bitterness to make this beer stand out with any dish. 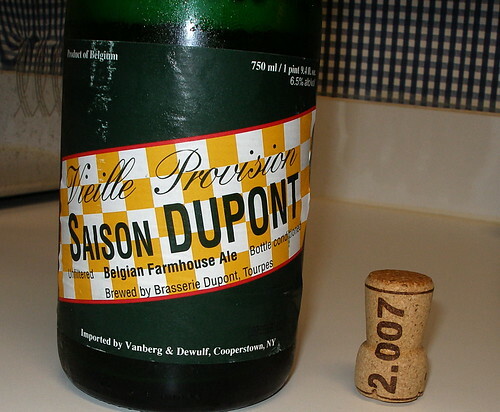 Saison Dupont is the classic example of this style and is widely available. Ayinger Celebrator – This traditional German doppelbock is dark brown and full of rich malt with flavors of toasted malt, a light caramel sweetness and just a bit of warming alcohol. It manages to have the perfect amount of complexity while remaining quite smooth. This should pair fantastically with both ham and turkey. Lost Abbey Avant Garde – According to Garret Oliver a Bière de Garde is the perfect compliment to dishes with strong herbal components (such as stuffing) and help to refresh the palate so you can still taste the turkey. Lost Abbey’s version is a dark golden color that has flavors of bready and caramel malts. It’s brewed with a lager year but at higher ale temperatures, which helps bring out some fruit esters and spicy phenols. Winter Ales – Winter ales are typically malt-forward and should pair well with what you’re having for dinner. There are plenty around, and a quick trip to the grocery store or bottle shop should yield several options. You’ll want to stay away from anything that’s too hoppy, at least for during dinner. Schlenkerla Helles Lager – This lager is on the lighter end of the malt spectrum, but just a hint of smoke will pair well with turkey while letting the refreshing beer still shine through. While this beer is not brewed with any smoked malt, it is made in the same kettles as the intensely-smokey Schlenkerla Rauchbier Märzen (also a great choice for dinner if you have lots of smoked meats). The Helles picks up just enough smoke to give it an added dimension. Two Beers Jive Espresso Stout – You can have this one for the morning football game (you’re not a lush, it’s got coffee in it), and then again with your pumpkin pie for dessert. This light ABV stout is brewed with locally roasted coffee. You’ll have to get a growler fill if you want this, but their taproom in SODO is open until 7pm tonight. Deschutes The Abyss – This high octane, intense imperial stout from the Bend brewery is an annual favorite. It’s full of dark roasted malt with chocolate, dark fruit, and light alcohol flavors coming through. Despite its 11% ABV, it drinks incredibly smooth for such a big beer. It was just released in Seattle last week, and while some retailers will sell out quickly others will have some on their shelves for quite a while. This would be a fun one to break out for dessert or to sip on after dinner. Make sure to share. If you have any Thanksgiving pairing favorites feel free to leave a comment. Thanks to alternatePhotography on Flickr for the photo. Tried to find a good dinner pairing: Popperings Hommel was fantastic with dinner!